Unlike the Apple I, the Apple II was fully assembled and ready to use with any display monitor. The version with 4K of memory cost $1298. It had color, graphics, sound, expansion slots, game paddles, and a built-in BASIC programming language. What it didn’t have was a disk drive. Programs and data had to be saved and loaded from cassette tape recorders, which were slow and unreliable. The problem was that disks – even floppy disks – needed both expensive hardware controllers and complex software. Steve Wozniak solved the first problem. He designed an incredibly clever floppy disk controller using only 8 integrated circuits, by doing in programmed logic what other controllers did with hardware. With some rudimentary software written by Woz and Randy Wigginton, it was demonstrated at the Consumer Electronics Show in January 1978. But where were they going to get the higher-level software to organize and access programs and data on the disk? Apple only had about 15 employees, and none of them had both the skills and the time to work on it. The magician who pulled that rabbit out of the hat was Paul Laughton, a contract programmer for Shepardson Microsystems, which was located in the same Cupertino office park as Apple. On April 10, 1978 Bob Shepardson and Steve Jobs signed a $13,000 one-page contract for a file manager, a BASIC interface, and utilities. It specified that “Delivery will be May 15?, which was incredibly aggressive. But, amazingly, “Apple II DOS version 3.1? was released in June 1978. With thanks to Paul Laughton, in collaboration with Dr. Bruce Damer, founder and curator of the DigiBarn Computer Museum, and with the permission of Apple Inc., we are pleased to make available the 1978 source code of Apple II DOS for non-commercial use. This material is Copyright © 1978 Apple Inc., and may not be reproduced without permission from Apple. Apple_DOS_RW_30May1978.txt The source code of the low-level read/write routines by Steve Wozniak and Randy Wigginton. The aim is to preserve the original hardware and software associated with the birth of the web. 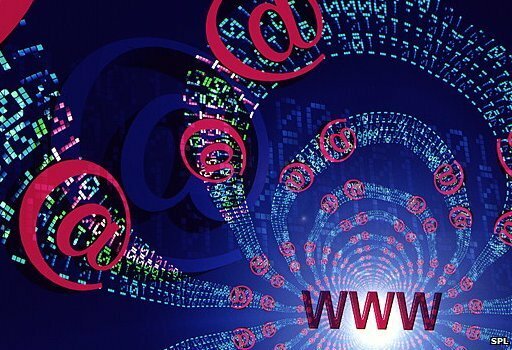 The world wide web was developed by Prof Sir Tim Berners-Lee while working at Cern. 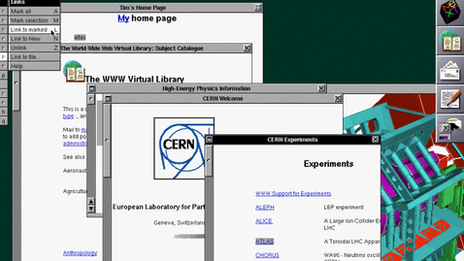 According to Dan Noyes, the web manager for Cern's communication group, re-creation of the world's first website will enable future generations to explore, examine and think about how the web is changing modern life. "We are in a unique moment where we can still switch on the first web server and experience it. We want to document and preserve that". It is the early technology's innate ability to subvert that makes re-creation of the first website especially interesting. While I was at Cern it was clear in speaking to those involved with the project that it means much more than refurbishing old computers and installing them with early software: it is about enshrining a powerful idea that they believe is gradually changing the world. I went to Sir Tim's old office where he worked at Cern's IT department trying to find new ways to handle the vast amount of data the particle accelerators were producing. I was not allowed in because apparently the present incumbent is fed up with people wanting to go into the office. But waiting outside was someone who worked at Cern as a young researcher at the same time as Sir Tim. James Gillies has since risen to be Cern's head of communications. He is occasionally referred to as the organisation's half-spin doctor, a reference to one of the properties of some sub-atomic particles. The first browser, for example, allowed users to edit and write directly into the content they were viewing, a feature not available on present-day browsers. Management agreed and signed a legal document that made the web publicly available in such a way that no one could claim ownership of it and that would ensure it was a free and open standard for everyone to use. Mr Gillies believes that the document is "the single most valuable document in the history of the world wide web". In the fall of 1977, I experimented with a newfangled PC, a Radio Shack TRS-80. For data storage it used—I kid you not—a cassette tape player. Tape had a long history with computing; I had used the IBM 2420 9-track tape system on IBM 360/370 mainframes to load software and to back-up data. Magnetic tape was common for storage in pre-personal computing days, but it had two main annoyances: it held tiny amounts of data, and it was slower than a slug on a cold spring morning. There had to be something better, for those of us excited about technology. And there was: the floppy disk. In the mid-70s I had heard about floppy drives, but they were expensive, exotic equipment. I didn't know that IBM had decided as early as 1967 that tape-drives, while fine for back-ups, simply weren't good enough to load software on mainframes. So it was that Alan Shugart assigned David L. Noble to lead the development of “a reliable and inexpensive system for loading microcode into the IBM System/370 mainframes using a process called Initial Control Program Load (ICPL).” From this project came the first 8-inch floppy disk. Oh yes, before the 5.25-inch drives you remember were the 8-inch floppy. By 1978 I was using them on mainframes; later I would use them on Online Computer Library Center (OCLC) dedicated cataloging PCs. The 8-inch drive began to show up in 1971. Since they enabled developers and users to stop using the dreaded paper tape (which were easy to fold, spindle, and mutilate, not to mention to pirate) and the loathed IBM 5081 punch card. Everyone who had ever twisted a some tape or—the horror!—dropped a deck of Hollerith cards was happy to adopt 8-inch drives. Before floppy drives, we often had to enter data using punch cards. Besides, the early single-sided 8-inch floppy could hold the data of up to 3,000 punch cards, or 80K to you. I know that's nothing today — this article uses up 66K with the text alone – but then it was a big deal. Some early model microcomputers, such as the Xerox 820 and Xerox Alto, used 8-inch drives, but these first generation floppies never broke through to the larger consumer market. That honor would go to the next generation of the floppy: the 5.25 inch model. Shugart also designed the diskette to be that size because an analysis of the cassette tape drives and their bays in microcomputers showed that a 5.25” drive was as big as you could fit into the PCs of the day. 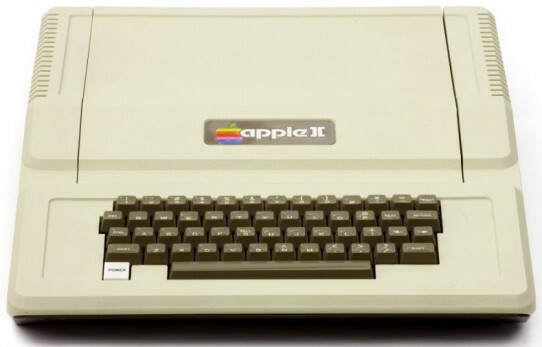 The bum's name was Steve Jobs and the “thing” was the Apple II. Which of these drives did you own? The success of the Apple II made the 5.25” drive the industry standard. The vast majority of CP/M-80 PCs, from the late 70s to early 80s, used this size floppy drive. When the first IBM PC arrived in 1981 you had your choice of one or two 160 kilobyte (K – yes, just oneK) floppy drives. Throughout the early 80s, the floppy drive became the portable storage format. (Tape quickly was relegated to business back-ups.) At first, the floppy disk drives were only built with one read/write head, but another set of heads were quickly incorporated. This meant that when the IBM XT PC arrived in 1983, double-sided floppies could hold up to 360K of data. There were some bumps along the road to PC floppy drive compatibility. Some companies, such as DEC with its DEC Rainbow, introduced its own non-compatible 5.25” floppy drives. They were single-sided but with twice the density, and in 1983 a single box of 10 disks cost $45 – twice the price of the standard disks. That left lots of room for innovation within the floppy drive mainstream. In 1984, IBM introduced the IBM Advanced Technology (AT) computer. This model came with a high-density 5.25-inch drive, which could handle disks that could up hold up to 1.2MB of data. A variety of other floppy drives and disk formats were tried. These included 2.0, 2.5, 2.8, 3.0, 3.25, and 4.0 inch formats. Most quickly died off, but one, the 3.5” size – introduced by Sony in 1980 – proved to be a winner. The one 3.5” diskette that everyone met at one time or another: An AOL install disk. The first 3.5” disks could only hold 720K. But they soon became popular because of the more convenient pocket-size format and their somewhat-sturdier construction (if you rolled an office chair over one of these, you had a chance that the data might survive). Another variation of the drive, using Modified Frequency Modulation (MFM) encoding, pushed 3.5” diskettes storage up to 1.44Mbs in IBM's PS/2 and Apple's Mac IIx computers in the mid to late 1980s. By then, though floppy drives would continue to evolve, other portable technologies began to surpass them. In 1991, Jobs introduced the extended-density (ED) 3.5” floppy on his NeXT computer line. These could hold up to 2.8MBs. But it wasn't enough. A variety of other portable formats that could store more data came along, such as magneto-optical drives and Iomega's Zip drive, and they started pushing floppies out of business. The real floppy killers, though, were read-writable CDs, DVDs, and, the final nail in the coffin: USB flash drives. Today, a 64GB flash drive can hold more data than every floppy disk I've ever owned all rolled together. However, the floppy drive took more than a decade to die. Sony, which at the end owned 70% of what was left of the market, announced in 2010 that it was stopping the manufacture of 3.5” diskettes. Today, you can still buy new 1.44MB floppy drives and floppy disks, but for the other formats you need to look to eBay or yard sales. If you really want a new 3.5” drive or disks, I'd get them sooner than later. Their day is almost done. Once Upon is a brilliant project that has recreated three popular sites from today as if they were built in the dial-up era, in 1997. Witness Facebook, with no real-names policy and photos displayed in an ugly grey table; YouTube, with a choice of encoding options to select before you watch a video, and Google+, where Circles of contacts are displayed as far easier to render squares. Be prepared for a wait though – the recreations are limited to 8kbps transfer speeds, as if you were loading it on a particularly slow dial-up connection. 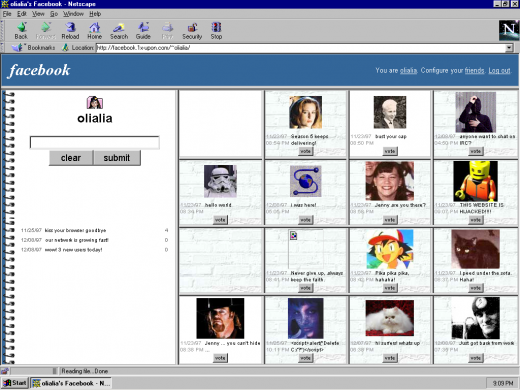 This is perhaps the most extreme version of Web nostalgia we’ve seen. On a related note, these imaginings of what online social networking would have been like in centuries gone by are worth a look. Also, our report on 10 websites that changed the world is worth reading- they’re not what you might expect. When Tim Berners-Lee arrived at CERN, Geneva's celebrated European Particle Physics Laboratory in 1980, the enterprise had hired him to upgrade the control systems for several of the lab's particle accelerators. But almost immediately, the inventor of the modern webpage noticed a problem: thousands of people were floating in and out of the famous research institute, many of them temporary hires. "The big challenge for contract programmers was to try to understand the systems, both human and computer, that ran this fantastic playground," Berners-Lee later wrote. "Much of the crucial information existed only in people's heads." So in his spare time, he wrote up some software to address this shortfall: a little program he named Enquire. It allowed users to create "nodes"—information-packed index card-style pages that linked to other pages. Unfortunately, the PASCAL application ran on CERN's proprietary operating system. "The few people who saw it thought it was a nice idea, but no one used it. Eventually, the disk was lost, and with it, the original Enquire." Some years later Berners-Lee returned to CERN. This time he relaunched his "World Wide Web" project in a way that would more likely secure its success. On August 6, 1991, he published an explanation of WWW on the alt.hypertext usegroup. He also released a code library, libWWW, which he wrote with his assistant Jean-François Groff. The library allowed participants to create their own Web browsers. "Their efforts—over half a dozen browsers within 18 months—saved the poorly funded Web project and kicked off the Web development community," notes a commemoration of this project by the Computer History Museum in Mountain View, California. 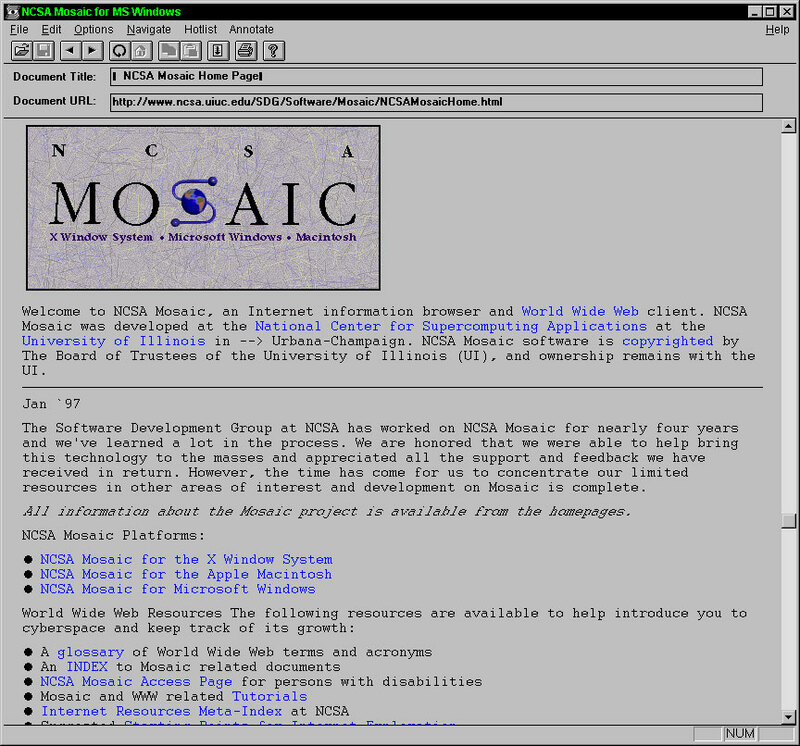 The best known early browser was Mosaic, produced by Marc Andreesen and Eric Bina at the National Center for Supercomputing Applications (NCSA). 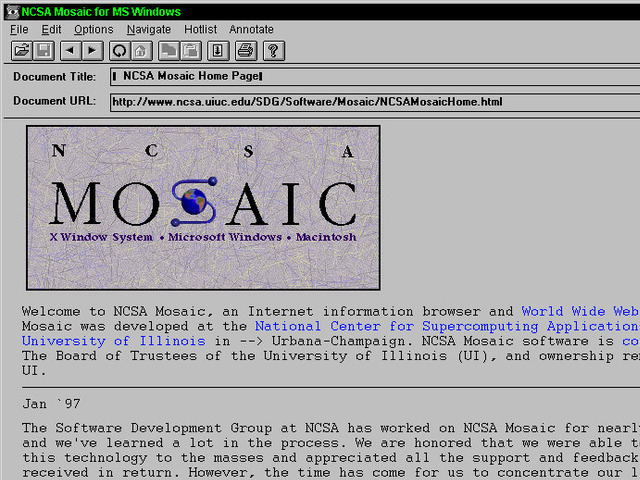 Mosaic was soon spun into Netscape, but it was not the first browser. A map assembled by the Museum offers a sense of the global scope of the early project. What's striking about these early applications is that they had already worked out many of the features we associate with later browsers. Here is a tour of World Wide Web viewing applications, before they became famous. 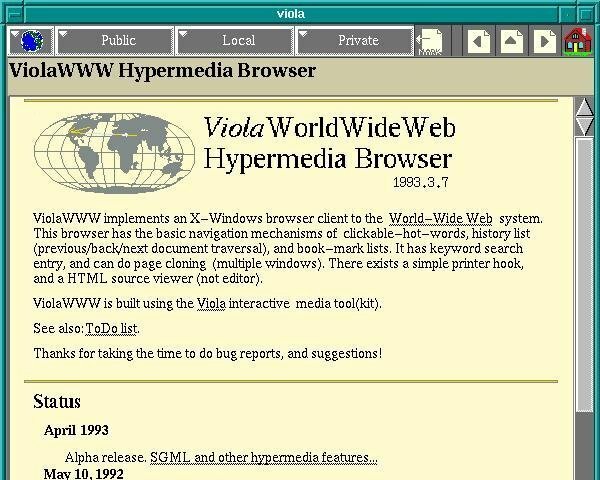 Tim Berners-Lee's original 1990 WorldWideWeb browser was both a browser and an editor. That was the direction he hoped future browser projects would go. CERN has put together a reproduction of its formative content. As you can see in the screenshot below, by 1993 it offered many of the characteristics of modern browsers. The software's biggest limitation was that it ran on the NeXTStep operating system. But shortly after WorldWideWeb, CERN mathematics intern Nicola Pellow wrote a line mode browser that could function elsewhere, including on UNIX and MS-DOS networks. Thus "anyone could access the web," explains Internet historian Bill Stewart, "at that point consisting primarily of the CERN phone book." Erwise came next. It was written by four Finnish college students in 1991 and released in 1992. 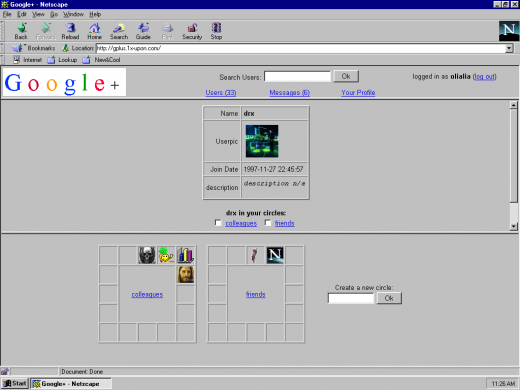 Erwise is credited as the first browser that offered a graphical interface. It could also search for words on pages. Berners-Lee wrote a review of Erwise in 1992. He noted its ability to handle various fonts, underline hyperlinks, let users double-click them to jump to other pages, and to host multiple windows. "Erwise looks very smart," he declared, albeit puzzling over a "strange box which is around one word in the document, a little like a selection box or a button. It is neither of these—perhaps a handle for something to come." So why didn't the application take off? In a later interview, one of Erwise's creators noted that Finland was mired in a deep recession at the time. The country was devoid of angel investors. "We could not have created a business around Erwise in Finland then," he explained. "The only way we could have made money would have been to continue our developing it so that Netscape might have finally bought us. Still, the big thing is, we could have reached the initial Mosaic level with relatively small extra work. We should have just finalized Erwise and published it on several platforms." ViolaWWW was released in April of 1992. Developer Pei-Yuan Wei wrote it at the University of California at Berkeley via his UNIX-based Viola programming/scripting language. No, Pei Wei didn't play the viola, "it just happened to make a snappy abbreviation" of Visually Interactive Object-oriented Language and Application, write James Gillies and Robert Cailliau in their history of the World Wide Web. 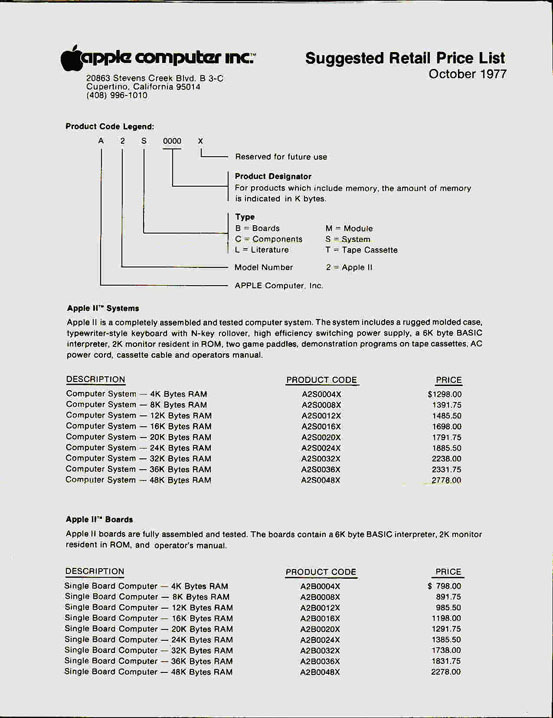 Wei appears to have gotten his inspiration from the early Mac program HyperCard, which allowed users to build matrices of formatted hyper-linked documents. "HyperCard was very compelling back then, you know graphically, this hyperlink thing," he later recalled. But the program was "not very global and it only worked on Mac. And I didn't even have a Mac." But he did have access to UNIX X-terminals at UC Berkeley's Experimental Computing Facility. "I got a HyperCard manual and looked at it and just basically took the concepts and implemented them in X-windows." Except, most impressively, he created them via his Viola language. One of the most significant and innovative features of ViolaWWW was that it allowed a developer to embed scripts and "applets" in the browser page. This anticipated the huge wave of Java-based applet features that appeared on websites in the later 1990s. In his documentation, Wei also noted various "misfeatures" of ViolaWWW, most notably its inaccessibility to PCs. Not ported to PC platform. HTML Printing is not supported. HTTP is not interruptable, and not multi-threaded. Proxy is still not supported. Language interpreter is not multi-threaded. "The author is working on these problems... etc," Wei acknowledged at the time. Still, "a very neat browser useable by anyone: very intuitive and straightforward," Berners-Lee concluded in his review of ViolaWWW. "The extra features are probably more than 90% of 'real' users will actually use, but just the things which an experienced user will want." In September of 1991, Stanford Linear Accelerator physicist Paul Kunz visited CERN. He returned with the code necessary to set up the first North American Web server at SLAC. "I've just been to CERN," Kunz told SLAC's head librarian Louise Addis, "and I found this wonderful thing that a guy named Tim Berners-Lee is developing. It's just the ticket for what you guys need for your database." Addis agreed. The site's head librarian put the research center's key database over the Web. Fermilab physicists set up a server shortly after. Then over the summer of 1992 SLAC physicist Tony Johnson wrote Midas, a graphical browser for the Stanford physics community. The big draw for Midas users was that it could display postscript documents, favored by physicists because of their ability to accurately reproduce paper-scribbled scientific formulas. "With these key advances, Web use surged in the high energy physics community," concluded a 2001 Department of Energy assessment of SLAC's progress. 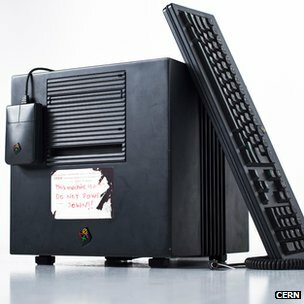 Meanwhile, CERN associates Pellow and Robert Cailliau released the first Web browser for the Macintosh computer. Gillies and Cailliau narrate Samba's development. For Pellow, progress in getting Samba up and running was slow, because after every few links it would crash and nobody could work out why. "The Mac browser was still in a buggy form,' lamented Tim [Berners-Lee] in a September '92 newsletter. 'A W3 T-shirt to the first one to bring it up and running!" he announced. The T shirt duly went to Fermilab's John Streets, who tracked down the bug, allowing Nicola Pellow to get on with producing a usable version of Samba. 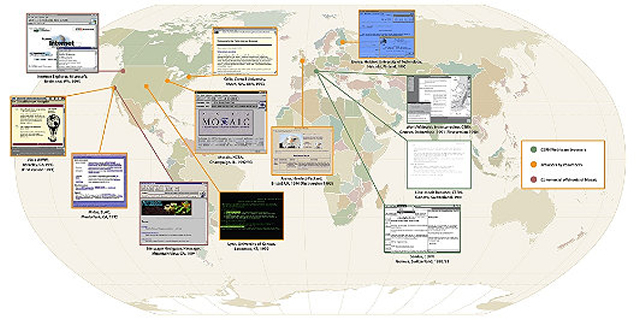 Samba "was an attempt to port the design of the original WWW browser, which I wrote on the NeXT machine, onto the Mac platform," Berners-Lee adds, "but was not ready before NCSA [National Center for Supercomputing Applications] brought out the Mac version of Mosaic, which eclipsed it." Mosaic was "the spark that lit the Web's explosive growth in 1993," historians Gillies and Cailliau explain. But it could not have been developed without forerunners and the NCSA's University of Illinois offices, which were equipped with the best UNIX machines. NCSA also had Dr. Ping Fu, a PhD computer graphics wizard who had worked on morphing effects for Terminator 2. She had recently hired an assistant named Marc Andreesen. "How about you write a graphical interface for a browser?" Fu suggested to her new helper. "What's a browser?" Andreesen asked. But several days later NCSA staff member Dave Thompson gave a demonstration of Nicola Pellow's early line browser and Pei Wei's ViolaWWW. And just before this demo, Tony Johnson posted the first public release of Midas. The latter software set Andreesen back on his heels. "Superb! Fantastic! Stunning! Impressive as hell!" he wrote to Johnson. Then Andreesen got NCSA Unix expert Eric Bina to help him write their own X-browser. Installing it was as simple as pulling it across the network and running it. Later on Mosaic would rise to fame because of the <IMG> tag that allowed you to put images inline for the first time, rather than having them pop up in a different window like Tim's original NeXT browser did. That made it easier for people to make Web pages look more like the familiar print media they were use to; not everyone's idea of a brave new world, but it certainly got Mosaic noticed. "What I think Marc did really well," Tim Berners-Lee later wrote, "is make it very easy to install, and he supported it by fixing bugs via e-mail any time night or day. You'd send him a bug report and then two hours later he'd mail you a fix." Perhaps Mosaic's biggest breakthrough, in retrospect, was that it was a cross-platform browser. "By the power vested in me by nobody in particular, X-Mosaic is hereby released," Andreeson proudly declared on the www-talk group on January 23, 1993. Aleks Totic unveiled his Mac version a few months later. 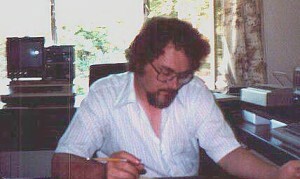 A PC version came from the hands of Chris Wilson and Jon Mittelhauser. The Mosaic browser was based on Viola and Midas, the Computer History museum's exhibit notes. And it used the CERN code library. "But unlike others, it was reliable, could be installed by amateurs, and soon added colorful graphics within Web pages instead of as separate windows." But Mosaic wasn't the only innovation to show up on the scene around that same time. University of Kansas student Lou Montulli adapted a campus information hypertext browser for the Internet and Web. It launched in March, 1993. "Lynx quickly became the preferred web browser for character mode terminals without graphics, and remains in use today," historian Stewart explains. And at Cornell University's Law School, Tom Bruce was writing a Web application for PCs, "since those were the computers that lawyers tended to use," Gillies and Cailliau observe. Bruce unveiled his browser Cello on June 8, 1993, "which was soon being downloaded at a rate of 500 copies a day." Six months later, Andreesen was in Mountain View, California, his team poised to release Mosaic Netscape on October 13, 1994. He, Totic, and Mittelhauser nervously put the application up on an FTP server. The latter developer later recalled the moment. "And it was five minutes and we're sitting there. Nothing has happened. And all of a sudden the first download happened. It was a guy from Japan. We swore we'd send him a T shirt!" But what this complex story reminds is that is that no innovation is created by one person. The Web browser was propelled into our lives by visionaries around the world, people who often didn't quite understand what they were doing, but were motivated by curiosity, practical concerns, or even playfulness. Their separate sparks of genius kept the process going. So did Tim Berners-Lee's insistence that the project stay collaborative and, most importantly, open. "The early days of the web were very hand-to-mouth," he writes. "So many things to do, such a delicate flame to keep alive." Even using the most detailed sources, studying history often requires a great imagination, so historians can visualize what the past looked and felt like. Now, new computer-assisted data analysis can help them really see it. 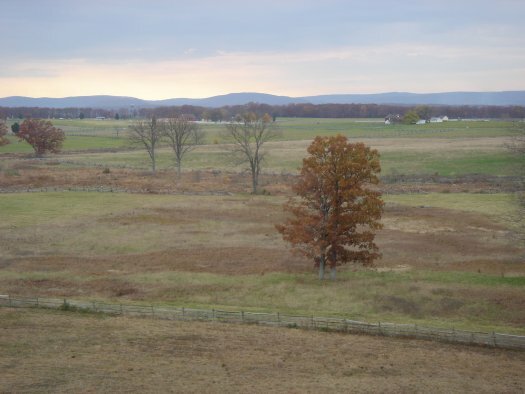 Geographic Information Systems, which can analyze information related to a physical location, are helping historians and geographers study past landscapes like Gettysburg, reconstructing what Robert E. Lee would have seen from Seminary Ridge. Researchers are studying the parched farmlands of the 1930s Dust Bowl, and even reconstructing scenes from Shakespeare’s 17th-century London. But far from simply adding layers of complexity to historical study, GIS-enhanced landscape analysis is leading to new findings, the New York Times reports. Historians studying the Battle of Gettysburg have shed light on the tactical decisions that led to the turning point in the Civil War. And others examining records from the Dust Bowl era have found that extensive and irresponsible land use was not necessarily to blame for the disaster. GIS has long been used by city planners who want to record changes to the landscape over time. And interactive map technology like Google Maps has led to several new discoveries. But by analyzing data that describes the physical attributes of a place, historians are finding answers to new questions. Anne Kelly Knowles and colleagues at Middlebury College in Vermont culled information from historical maps, military documents explaining troop positions, and even paintings to reconstruct the Gettysburg battlefield. The researchers were able to explain what Robert E. Lee could and could not see from his vantage points at the Lutheran seminary and on Seminary Hill. He probably could not see the Union forces amassing on the eastern side of the battlefield, which helps explain some of his tactical decisions, Knowles said. Geoff Cunfer at the University of Saskatchewan studied a trove of data from all 208 affected counties in Texas, New Mexico, Colorado, Oklahoma and Kansas — annual precipitation reports, wind direction, agricultural censuses and other data that would have been impossible to sift through without the help of a computer. He learned dust storms were common throughout the 19th century, and that areas that saw nary a tiller blade suffered just as much. The new data-mapping phenomenon is known as spatial humanities, the Times reports. Check out their story to find out how advanced technology is the future of history. 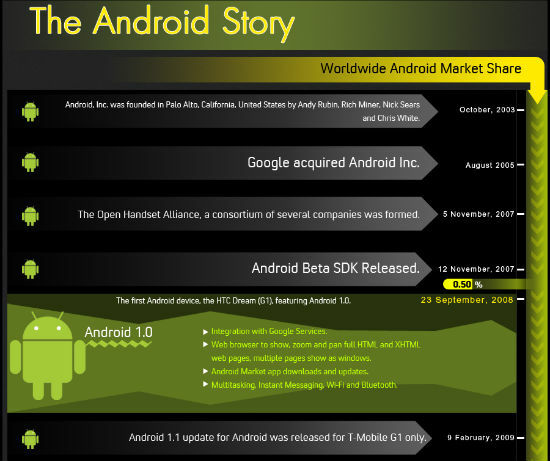 Check out this infographic by [x]cubelabs showing the history of Android version releases to date… even tossing in a factoid of when Android was officially started then acquired by Google. The graphic shows key feature highlights in each milestone and concludes with today’s snapshot, which shows most Android devices with Android 2.2 (Froyo). Have a look! 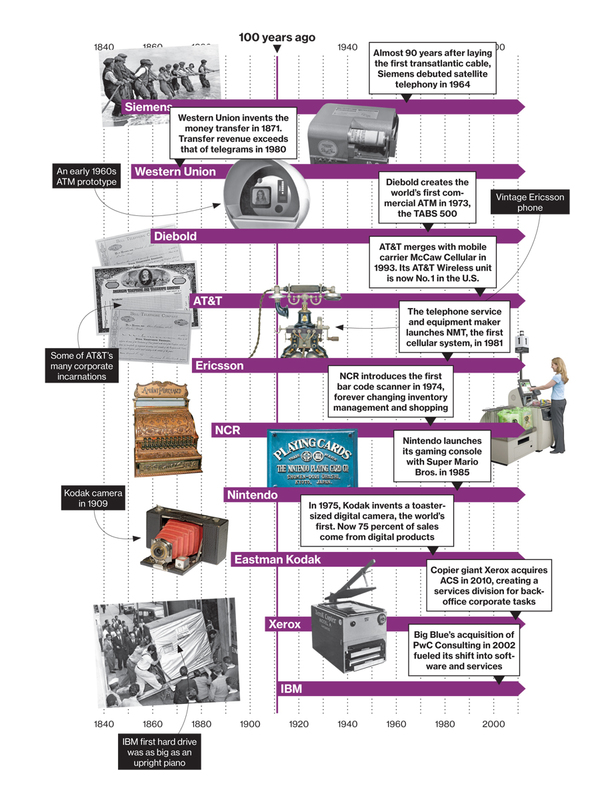 When IBM turned 100 on June 16, it joined a surprising number of tech companies that have been evolving in order to survive since long before there was a Silicon Valley. Here’s a sampling of tech centenerians, and some of the breakthroughs that helped fuel their longevity.